Today, armed services agencies are faced with increasingly sophisticated digital threats that often go unseen by conventional security platforms. That’s why agencies must continuously monitor assets to ensure compliance while leveraging huge troves of data for intelligence. 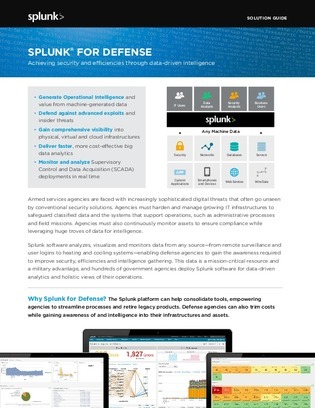 In this brief, learn how Splunk software analyzes, visualizes and monitors data from any source—from remote surveillance and user logins to heating and cooling systems—enabling defense agencies to gain the awareness required to improve security, efficiencies and intelligence gathering.